A prison hulk, Deptford, artist unknown. Henry Hackett was the maternal grandfather of husband of one of my great-great-aunts, and maybe not even that... so a rather distant relation. And things became even more, way more distant, when he was deported for burglary! It's a story of prison hulks, Dickensian images, and a family that kept growing despite him being on the other side of the world. Henry Hackett was born in Wigston, Leicestershire, in 1818. I believe he was baptised in Wigston Magna (Greater Wigston) Independent chapel on 15th March, 1819, to parents William Hackett and Charlotte (nee Bates). Henry married Esther Brewin (also spelled Bruin) on 23 November, 1838, when both bride and groom were aged twenty. The wedding ceremony was performed at the Anglican church in Wigston Magna--All Saints'--and both of the spouses' fathers, and the spouses themselves, were all working as framework knitters. At least, I am pretty certain that Sarah Ann is Henry's daughter. I have ordered Sarah Ann's birth certificate to be 100% sure. Without the birth certificate, we cannot know Sarah Ann's exact birth date--it could be any day between mid-March and June 30th. Most likely, she was born at during the early part of the registration quarter. Why does this matter? It matters, because on 7th August, 1840, Henry Hackett was sentenced, in Leicester, to ten years' deportation, and despatched to a prison hulk, Justitia, in Woolwich, London, before being shipped to Tasmania, Australia in May, 1841 on the convict ship called David Clark, one of 308 prisoners making the journey. I doubt that conjugal visits were allowed on prison hulks, though you never know. Leicestershire Mercury, 8 August 1940. Henry Hackett was charged with breaking into the house of a Mrs. Fox in Wigston, and stealing "jars, keys, and other items". The Leicestershire Mercury on 8th August went into more detail, and stated that he was suspected of stealing two pounds of mutton, a pound of butter, a loaf of bread, five jars of preserves, and a jar of pickles. Someone was hungry. Maybe his wife was craving the pickles during early pregnancy. If he had stolen the goods for his family rather than to resell, or just because he wanted a snack, then very sadly, Henry was soon to leave his wife and child in a far hungrier state. Committed to trial at the county assizes, and then sent to London, he ended up on the other side of the world, never to return. He died in Richmond, Tasmania, on 19th November, 1847. 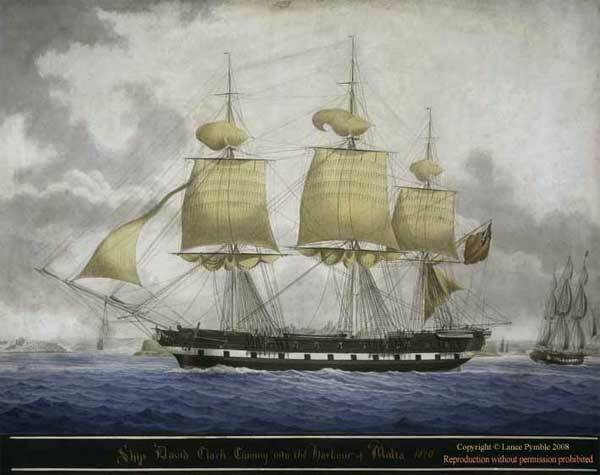 The prison hulk that Henry was held on for the months prior to shipping out to Tasmania, was called the Justitia in 1840, but had had a long prior history as the HMS Hindostan, sailing to India, Australia, the Mediterranean. 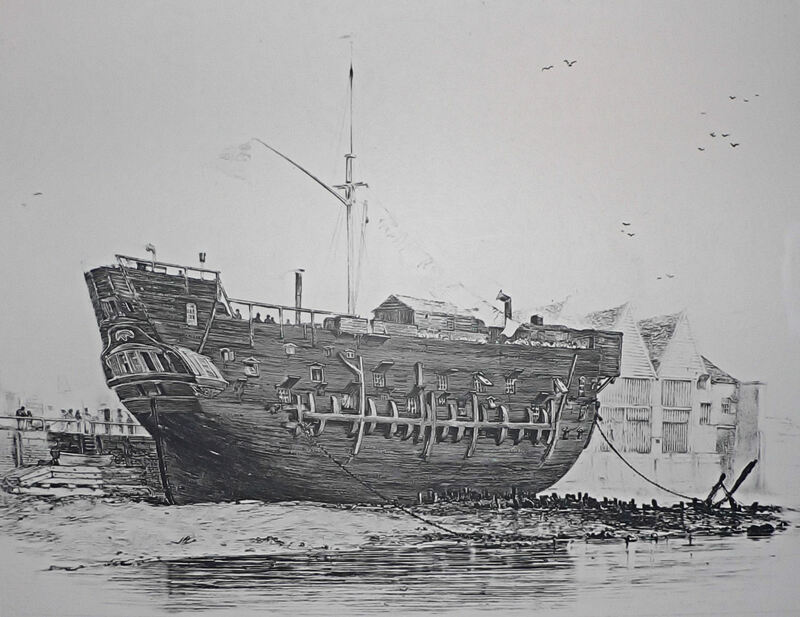 No longer seaworthy, by 1840 she had been "hulked"--her masts and other parts removed, leaving just the hull and decks--and converted to a prison--a common practice in the early 19th century. The sort of place that Abel Magwitch escaped from in Dickens' Great Expectations. Richmond, Tasmania, was the end of Henry Hackett. Unless, of course, Henry had a personal transporter that allowed him to return to Leicestershire and impregnate his wife several more times, both before, and after, his death. Emma Louisa Hackett was born in 1846, with Adah Maria in 1850, Amelia Catherine in 1855, and Martha Ellen in 1860. (All were registered as Hackett, in Esther's married name, despite no Henry in sight!) It might have taken a while for news of Henry's death to reach Wigston Magna, allowing Esther to marry again: in 1851, Esther was living with her sister, Mary Percival, Esther's baby Adah only eight months old and Henry long gone; in 1861 she was living as a housekeeper in the household of John Holmes, a 42 year old bachelor. In 1871? Esther was Mrs Esther Holmes, having married John in 1864. I wonder if there are any Hackett descendants in Hobart? UPDATE: Sarah Ann was indeed registered as Henry's daughter. Born on the 22 April, 1941 in Wigston Magna (Greater Wigston), her mother Esther must have been only three or four weeks pregnant when Henry was sent for trial at the Assizes.